This CD project was made possible by the Award of the Shiers Trust Grant in 2004. The Award is facilitated by the Royal Television Society in association with the British Film Institute, BBC Heritage and the National Media Museum in Bradford, West Yorkshire. 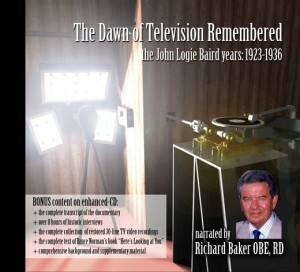 Presented across two discs is a two-hour in-depth audio documentary on the dawn of television in Britain – from Baird’s first experiments in Hastings in 1923, through the pioneering 30-line TV broadcasts by the Baird Company and the BBC, to the start of the BBC’s high definition service in 1936 – all set in an international context and narrated by the BBC’s first television news-reader – Richard Baker OBE RD. The early pioneers featured on the documentary are: Betty Astell, A F Birch, T H Bridgewater, D R Campbell, Cyril Fletcher, W C Fox, R M Herbert, T M C Lance, N Loxdale, Marsland Gander, Victor Mills, Geoffrey Parr, J D Percy, P Reveley, C L Richards and William Taynton. There are 58 audio tracks on Disc 1 and 29 audio tracks on Disc 2. For the first time, the Complete Collection of restored 30-line TV recordings (spanning 1927-1935) can be seen in their entirety. Along with a short film on the work of restoration, and extracts from a 1967 remake of the first British TV play (as a joint BBC-Baird production) there are over 52 minutes of MPEG-1 video clips to explore. In addition there are several extras including some 1600×1200 images that can be used as computer wall-paper, some interesting early pictures to explore, a short biography of John Logie Baird (by Don McLean) and of one of the sponsors George Shiers (by Prof Chris Sterling of GWU), together with an extensive Bibliography and other material. The audio documentary and the collection of reference-quality material on enhanced-CD offer something new to experts and newcomers alike, though this is by no means a light-weight ‘sound-bite’ filled documentary – it is a serious in-depth presentation with lengthy descriptions. If your CD-player can display it, CD-TEXT per track helps identify who’s speaking about what on which track. In addition a full transcript is available in the data portion of Disc 2 in Adobe Acrobat PDF format (printable in both US letter and A4 formats). Those with access to a compatible computer will get significantly more out of this CD than those without. The overall aim of this production is to help recognise the achievements of the engineers, producers and performers – all of whom developed the fledgling medium from scratch. The audio content of this CD-set is not simply a historical but a social record of a unique time where engineering and technology led the pioneering development of a new communications medium, using methods that were inconceivable 100 years before. I have been absolutely overwhelmed by the completely unexpected feedback from buyers of this disc. It is not an overstatement to say that many of the buyers have written back to me and all have been full of praise. I can only say in response, thank you for having faith enough to take the step and order from me. I am delighted that you have all been pleasantly surprised by what you received. Disc 2 of the set is an enhanced-CD (also known as Mixed-Mode or CD-EXTRA). It behaves like an ordinary CD-audio disc when in a CD or DVD player, where it plays the second part of the audio documentary. It behaves like a CD-ROM when used in a computer. The disc may auto-start to your computer’s media player when first inserted. In that event, make sure that you close the media player software, then use My Computer or Windows Explorer (or equivalent) to locate your removable disc drive. The content of the disc should then appear as a CD-ROM drive. Double-clicking on Home (possibly with .htm extension showing) should open your browser and you can then proceed to navigate the disc. Should this fail, refer to the file list in the booklet and navigate to the folders /Audio, /Video and /PDF for the bonus content, where a Notepad text file will describe the contents in detail.